Colony Roofing Inc. provides roof repair services with guaranteed exceptional results. Our skilled and professional roofers will quickly determine the amount of damage to your roof and come up with a cost effective plan to repair it. We are proud to offer competitive pricing and flexible scheduling to better serve you. No matter what the roofing problem, we can fix it. Our roof inspections and estimates are always free, so call us today to see how we can help you. We are familiar with all types of roofing materials and every style of roof. Different methods need to be applied to repair each roofing material. 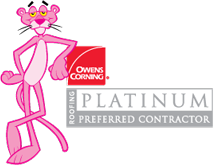 Whether you have a flat roof or shingled roof, we will quickly handle your repair. Every roof has different needs, and we can handle any roofing problem that arises. Roof leaks need to be taken very seriously. A leaky roof can lead to mold growth, damage the contents of your home, and cause other serious damage. Don’t let a small roof leak, turn into a huge problem. Call us today to schedule your free inspection and estimate.